This classic pineapple favor symbolizes a warm welcome, hospitality, friendship, generosity and graciousness. 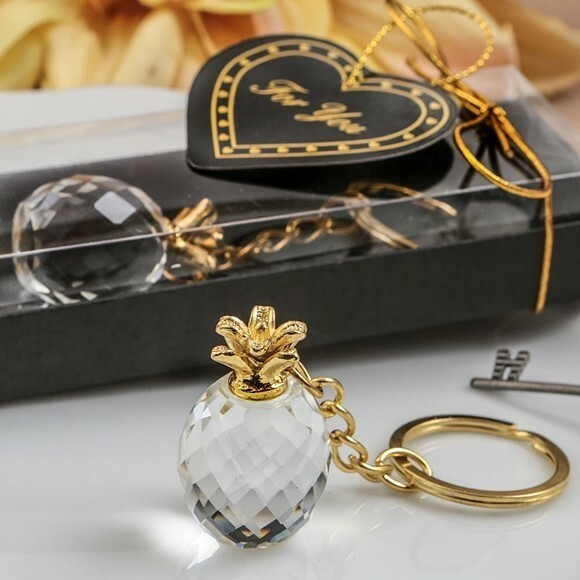 This premium glass Choice Crystal pineapple key chain features an intricately-faceted clear glistening glass pineapple base. Atop the pineapple is an exquisitely carved pineapple stalk in a delicate gold color crystal. The pineapple charm is attached to a gold metal chain and ring. Sold individually, each comes packaged in a display-topped black gift-box finished with a gold metallic ribbon and bow. Attached to the ribbon is a heart-shaped 'For You' tag. PLEASE NOTE: Due to regulations under Proposition 65, this item cannot be shipped to California.